This Instant Pot Corn Chowder is a potato corn chowder that's packed with flavor! Using an instant pot makes this already easy soup even easier! 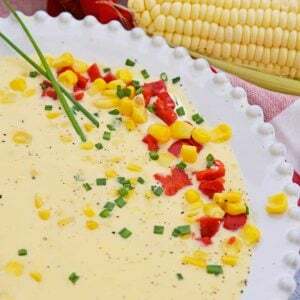 You'll never want to make another corn chowder recipe again. Heat inner pot of Instant Pot to saute, add butter and melt. When butter has melted, add carrot, celery, white onion and chopped potato. Saute for 4-5 minutes, or until vegetables start to soften and become fragrant. Add chicken stock, bay leaf and 1 cup frozen corn. Place lid on Instant Pot, turning the vent to "sealed". Change setting to manual, high pressure for 5 minutes. Allow to naturally release for 10 minutes before removing lid. Using immersion blender, add cream and cornstarch mixed with 1/4 cup water. Blend until smooth. Add Kosher salt, black pepper and remaining 1 1/2 cups frozen corn. Stir in while Instant Pot is still on "keep warm" setting and allow to sit for 3-4 minutes. Ladle into bowls and garnish with roasted red pepper, chives, sour cream and Maldon sea salt.